Instructions on the use of the Surbiton & District Bird Watching Society Online Recording System. Contributions from non-society members are welcome. Please refer to the map of the Society’s recording area to be sure that your records are of interest to the Society. The system is very user friendly and you may only need to refer to the below under certain circumstances. From the drop-down menu under ‘Recording’ choose ‘Submit Records’ or click on this link. Fill in your name in the first box. Surname first followed by an initial or your first name. If you wish these to remain private tick the box to the right. If you have one, fill in your e-mail address. This will not be displayed in the archive and so cannot be seen by other than the society recorder and a few other administrators. If you regard your record as sensitive in any way, such as a rare breeding species and you wish the site to remain secret, tick the appropriate box to the right. Enter the date of your sighting in the appropriate box. From the drop-down list, choose a site which is most appropriate for your record. If this relates to a street fill in the town you believe it relates to. All the streets in our area are on a separate list in a box to the right and the associated town is also displayed, which may not always be a match for that you will have entered under ‘Site’. The one you used under site will take priority in our publications. PLEASE AVOID USING JUST THE TOWN e.g. Surbiton, as far as possible but this is acceptable for fly-overs. If you wish to submit records from a variety of sites and streets there is a blank box at the top of the street list which will cancel any streets previously input. If your record is on, or close to, a section of one of our rivers these are listed in the direction of flow and the word River is just represented by the letter R. e.g. R Thames. If you cannot find the exact site on the list, please submit under the nearest road and describe the exact position in the ‘Comments’ box. 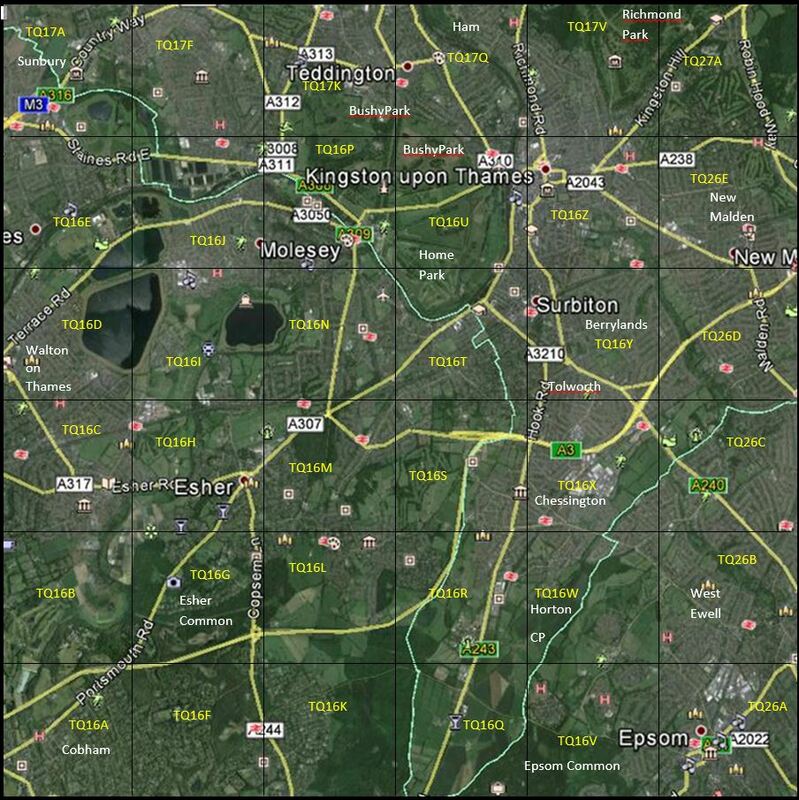 It is not necessary to fill in the ‘Square’ box but 2Km square tetrads are on the map e.g. TQ16Y. Select the species from the dropdown list. Options for Hybrid, Escapee and Unidentified are provided. Details in the ‘Comments’ box please. Only species that have been recorded in the Society’s area are listed. If you have seen a species not on the list, please email the recorder. Also email if you see a rare species that others may wish to see so that details can be circulated. Please fill in the breeding status if appropriate. These relate to the BTO system. Click the blue ‘Submit’ button and a red notice comes up that the record has been uploaded. You can check on the ‘Archive’, accessed from the drop down menu, that all is OK. MISTAKES. If you notice that you have made a mistake it is not possible for you to correct this at present. Send an email to the recorder and request him/her to correct or add another record and ask for the correction in the ‘comments’ box. If you prefer records can be sent in bulk to the recorder on an excel spreadsheet, using the form found here, preferably to arrive in time for the Newsletter. All the species that have been recorded in the Society’s area are on the dropdown list and within the ‘Archive’ section it is possible to search and find out where species have occurred in the past. Our recording area is TQ16, the Ordnance Survey National Grid Reference for the ten kilometre grid square, but extended by 2km to the north and east. You can see these grid references on the OS Landranger maps. Recent sightings can be found here. 4. For online back-up of bird records by the organization which is providing this service. The Society will only supply the personal information to any other third party (unless the Society has permission from the person) if required to do by law. A recent study of SDBWS records has shown that several sites in the Society’s recording area, which over the years have produced worthwhile sightings, no longer appear to be visited regularly by Society members. Below is a list of species you might expect to see during a birding year at three adjoining sites close to Epsom. If you live close to any of these ‘forgotten’ sites, please think about visiting them, the more frequent the better, and send in your records to the SDBWS Recorder, Tony Quinn. You don’t have to be a ‘twitcher’ to want to enjoy unusual birds locally. If you missed out on the waxwings, at Horton Country Park or the egrets on the Hogsmill, why not let us have your email address and you can be added to the Hot News circulation list. But please remember to let us know when it changes. Email addresses and comments to Tony Quinn for the Hot News service.